FlipBook Writer is flexible enough software for all levels of users to create professional page-flipping eBooks. It will integrate your RTF files, images, and even text extracted from webpages, PDFs etc. 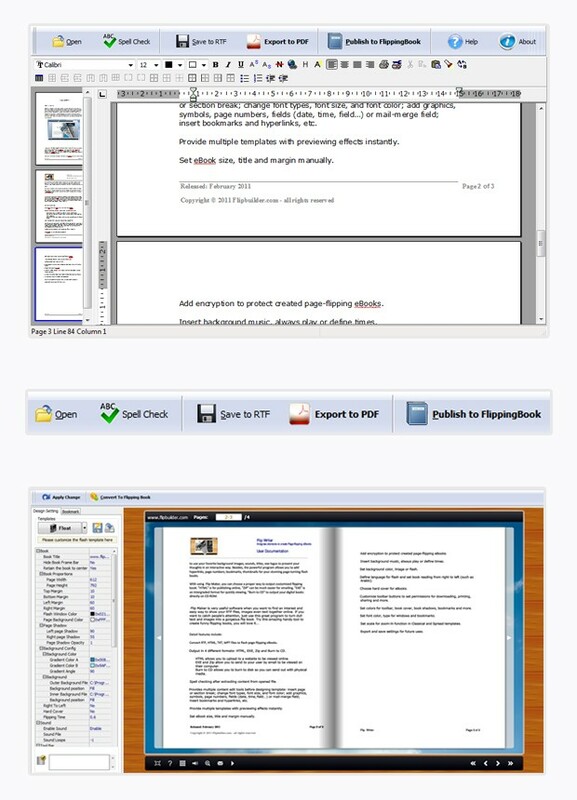 The output flash eBook pages can be flipped automatically or by manually clicking on the page corner.Provides multiple content edit tools, such as spell checking, font tools etc. Customize look and feel and publish your book online. ...... If you want to catch people's attention, just use this great program to turn dull text and images into a gorgeous flip book. Try this amazing handy tool to create funny flipping books, you will love it! Flipping eBook can display on iPhones, iPad, iPod Touch, and even Android-powered devices which provide enough convenience to those people who are always on-the-go, even only can work with their portable devices. You can share your books with anyone around the world, no matter PC or mobile readers, they all can easily surf page-turning eBook, magazine, brochure, flysheet, etc anywhere. Create online flash page flipping magazine with Realistic flipping action effect, gives the readers a sense of familiarity and ease. Build your interactive flipping book for both online and offline use in minutes. A fully free YouTube downloader can download FLV from YouTube, MySpace, etc. Qweas is providing links to FlipBook Writer Free Download 2.5 as a courtesy, and makes no representations regarding FlipBook Writer Free Download or any other applications or any information related thereto. Any questions, complaints or claims regarding this application FlipBook Writer Free Download 2.5 must be directed to the appropriate software vendor. You may click the publisher link of FlipBook Writer Free Download on the top of this page to get more details about the vendor.